James Cardoza, of the Mission Police Department, talks with other coordinators at the Mission Fire Station Thursday as they organize for a disturbance before the start of the weekend that is predicted to bring heavy rainfall. Hidalgo County officials are “preparing for the worst (and) anticipating for the best,” as clusters of showers and thunderstorms in the Gulf of Mexico threaten to organize into a tropical cyclone headed toward the Texas coast, bringing more rain to a county already drenched by 15 inches of water since Sunday. 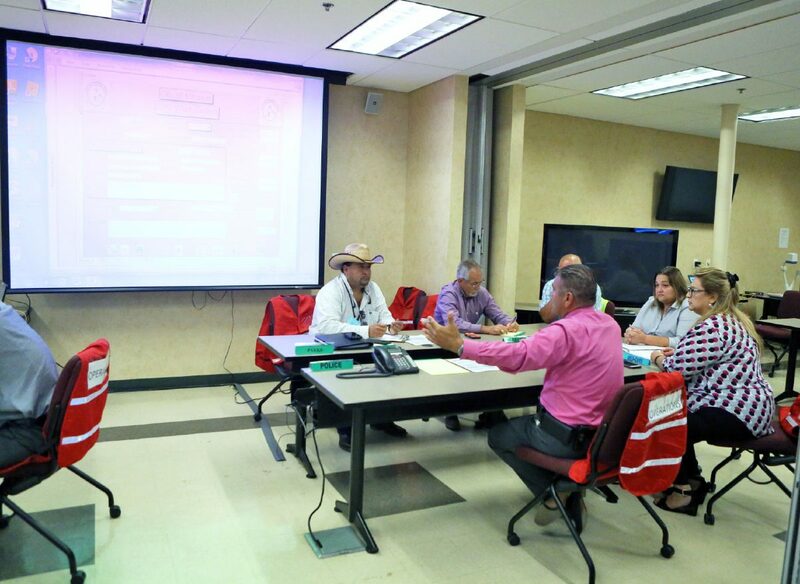 The worst, according to Hidalgo County Emergency Management Coordinator Ricardo Saldaña, would look similar to the June floods if the region’s already-saturated grounds are hit by as much as 10 inches of more rainfall. “We’re going to have potential problems with significant flooding … ” Saldaña said. Whether the storm system in the Gulf becomes a tropical cyclone isn’t important, as it won’t have much time to organize before it makes landfall, according to Barry Goldsmith, warning coordination meteorologist with the National Weather Service at Brownsville. Coordinators from the city of Mission make storm preparations at the Mission Fire Station Thursday. The storm system is expected to hit Cameron County early Friday morning and continue west through the weekend, Goldsmith said, dumping an average of 3/4 to 1.5 inches of rain across the Rio Grande Valley Friday, with the possibility of some areas receiving up to 6 inches. “It’s all about potential right now,” he said, noting that forecasters need more data and time for the system to develop. 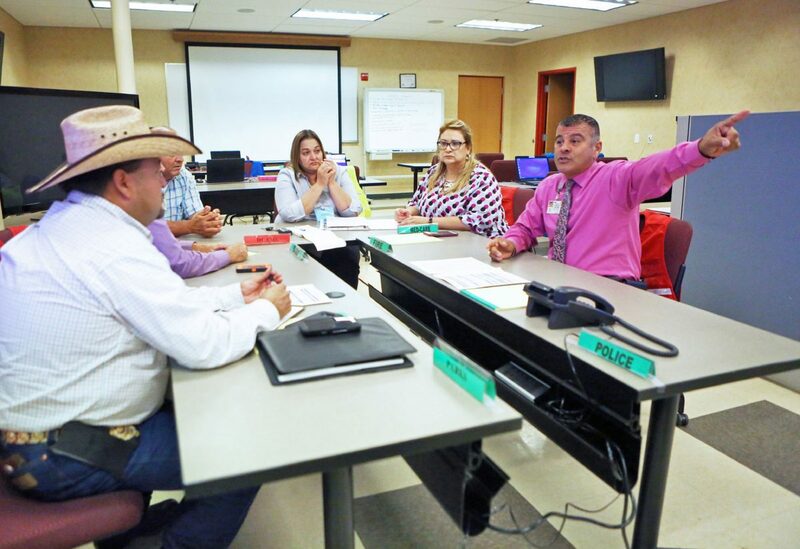 Whereas the heavy rains that hit Hidalgo County in late June over a two-day period were sudden and unexpected, officials — at the state and local level — have been tracking the storm system in the Gulf since Monday and staging water pumps and equipment in the event that significant portions of the county flood. The county is urging residents who live in low-lying areas to make preparations to evacuate to higher ground in advance of the potential heavy rainfall. The entire Valley — Cameron, Willacy, Hidalgo and Starr counties — is under a flash flood watch until Friday evening, according to the NWS. On Wednesday night, first responders evacuated approximately 25 people from stranded vehicles in the Edinburg and Weslaco areas and nearly a dozen people from Edinburg homes, Saldaña said, after these areas received upwards of 3 inches of rain. Since Sunday, the Valley has been hit by rains separate from the tropical disturbance, which has led to localized flooding. The area south of U.S. Highway 83 to the Rio Grande spanning from Mission to Pharr received 5.5 inches of rain Sunday night; on Monday night, the western part of the county north of State Highway 107 received 10 inches; Edinburg, Weslaco and the Delta area received 3.5 inches Tuesday, followed by 3 inches of rain Wednesday night, with western Hidalgo County getting up to 2 inches of rain early Thursday, according to Saldaña. Despite this rainfail, the county’s arroyos and drainage ditches are not at full capacity, Saldaña said. These storm systems have enabled the county to identify new regions, particularly in western Hidalgo County, that could be prone to significant flooding if the potential tropical cyclone drops anywhere between 4 to 10 inches of rain, and pumps have been deployed to these “critical areas,” Saldaña said. 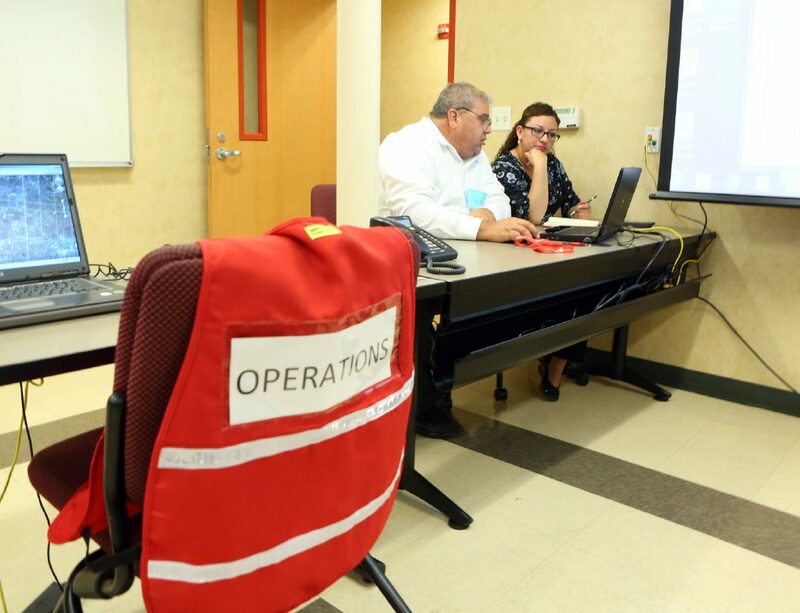 The county encourages residents in need of assistance regarding weather-related issues and sandbag distribution to contact its call center at (956) 292-7750, which will be staffed from 8 a.m. to 6 p.m. Friday.